Literary elements at work in the story: This book is a children’s Bible storybook, a genre quite distinct from a children’s Bible. These stories generally follow the order of scripture, though some longer narratives are broken up into several sections. For instance, the natal stories of Moses are separated from the narratives of slavery and exile by tales of several other Old Testament heroes in a section called “Strong Women and Men,” and the story of the Ten Commandments is in an entirely separate section called, “Listening for God.” While there is a Scripture Index at the end of the book, there is no topical index. A teacher or parent may need to do a little sleuthing to find a particular story in the Table of Contents. (The story of the burning bush, for example, is entitled, “Moses and the Special Holy Place.”) Contributors often begin entries with a sentence or two to give some background on the setting, introduce the main characters, or make a connection to modern-day life for the listener. The language is clear and simple, though with very little of the poetic beauty of the original text. What is lost of the mystery and beauty of scripture, however, may be made up for in the approachability of these retellings. Theological conversation partners: Many parents in our churches do not feel adequately equipped to share scripture with their children, because they are unfamiliar with the Bible themselves. Introductions to each section of this story Bible will be of great help to parents such as these. They give good, simple overviews, set the stories in historical as well as scriptural context, and suggest how the stories might speak to us today. Hear: What do you think the older brother would like to say to the younger brother? See: What’s another way this story could have ended? Act: Count the people who love you. Count the people you love. Who else do you want to add? Beth Lyon-Suhring, Director of Christian Education at the St. Andrew Presbyterian Church in Suffolk, VA, is our book reviewer today. 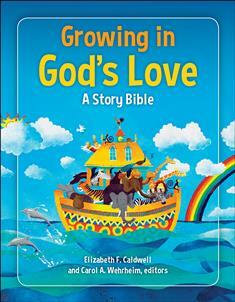 Growing in God’s Love: A Story Bible by Storypath is licensed under a Creative Commons Attribution-NonCommercial 4.0 International License.